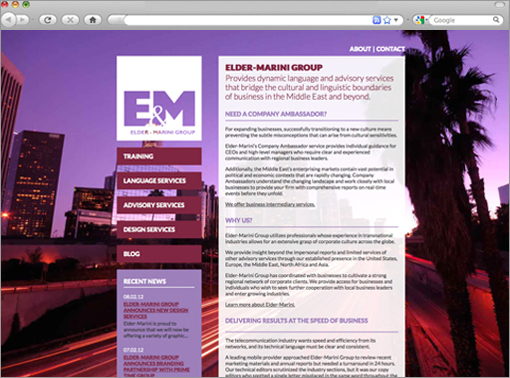 Elder-Marini is an advisory service company based in Jordan that assists businesses in Northern Africa, the Middle East, and Asia looking to expand into the global marketplace. They provide businesses with a cultural and linguistic understanding so that they may successfully translate to a global audience. In addition to business consulting, Elder-Marini provides clients with design services such as logos & branding, web, and print materials. 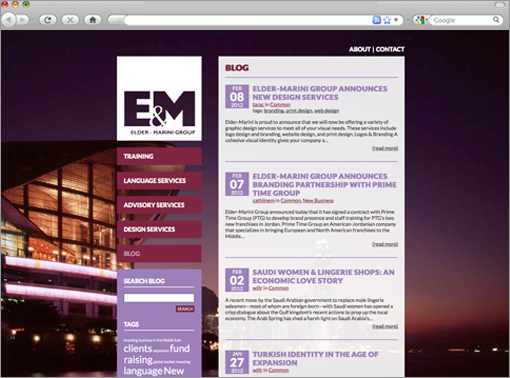 Unhappy with their current site, they approached us about a redesign. We sought to communicate their sense of global understanding through the use of visually striking background images that featured a mix of eastern and western cities. The rest of the design is organized and minimal in order to convey their modernity.